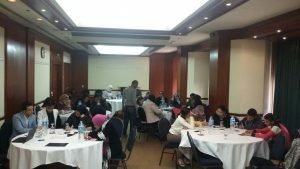 ALEF – Act For H uman rights, along with its child volunteers, participated in the Manara network’s 2017-2021 strategic advocacy planning workshop which took place in Cairo from the 19th till the 21st of December 2016. The workshop granted the child volunteers from the different partner organizations the opportunity to be part of the networks decision making process in the design, planning, and setting of an action plan for the mutual advocacy theme ” ending violence against children in the Arab world ” between the partner organizations. The child participants portrayed their vision for the networks strategic outlook for the upcoming 5 years and finally, drafted a slogan for the campaign which they presented during a press conference at the end of the workshop.